Don’t let this trailer fool you. Sure, the visual style of it is exactly like the game’s, but the gameplay is far different, as it has the point-and-click approach. 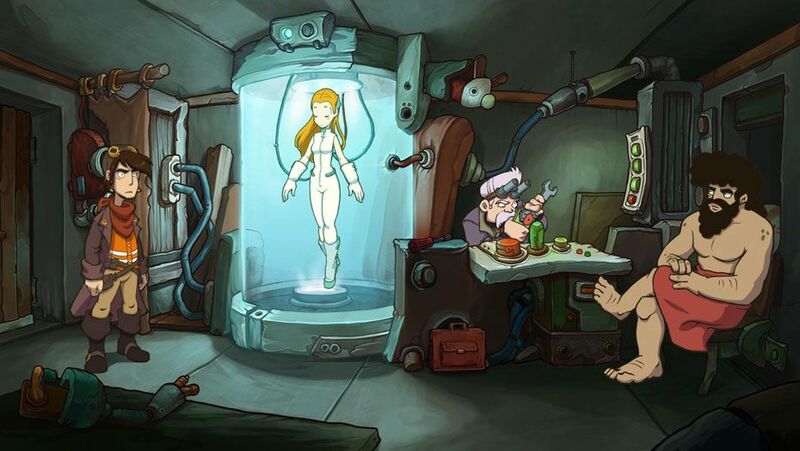 In case you don’t know, Goodbye Deponia resembles something like a LucasArts game from the 1990s. The issue here is that Daedelic released the game on PlayStation 4 in an extremely silent, sneaky way at the end of January. It didn’t get much of fanfare aside from Sony’s PlayStation YouTube-channel, but we have seen questionable trailers there as well. (Life of Black Tiger, anyone?) Aside from that, I’d go a bit into the technicalities of the console port, as there are some differences from the PC version. I think the frame rate isn’t that big, which is somewhat unusual from something like a point-and-click game. This possible change doesn’t affect the gameplay whatsoever, and the visuals also got decently carried over to Sony’s console. I just cannot introduce the console differences (and I’d like to take the chance here to congratulate the uploader for standing still for half an hour in the video), as I could say how the D-Pad, the Triangle, and the X buttons are necessary, but this thought should be shown in a way or another, and images/videos do it the best. The reader might think that I’m just dodging the character limit by embedding the videos, and while they might be correct, I have to discuss the changes from a PC original to a console version. While I’m at it, I’d also like to mention the story of the roughly ten-hour game (and the trilogy has two previous games, both are already available on PS4): Rufus, the protagonist, wants to finally leave the dumpster fire of a planet called Deponia behind to be a citizen of a flying city named Elysium. It seems the Germans seem to either have a liking towards point-and-click games, or they have some sort of a renaissance of the genre, or maybe they did not leave the past behind. Aside from the Deponia games, I do have to mention the recent Leisure Suit Larry-revival, which was also done by a developer team set in Germany (and their work was stupendous!). The Visionaire Studio engine works fine in all three Deponia games (or maybe the fourth one, released in 2016, uses it, too?). However, you have to ask yourself whether you want to take this adventure for twenty or so dollars or euros. If your answer is yes, then do not start with this game. Instead, get the first part of the trilogy, named simply Deponia. I think the developer/publisher might pull a complete edition (and PHYSICAL!) release dubbed Deponia Doomsday Edition with all four games available (the fourth one is called Deponia Doomsday(. It would make sense. Also, the game is niche, no matter how we look at it. However, this thought will not affect the rating (as I firmly believe the game is worthy of an 8 out of 10), but sales-wise, I don’t think it will sell extremely well. Let’s support Daedelic by a purchase, especially if you are into the LucasArts games (Full Throttle, Grim Fandango… both got remastered by Double Fine, I know, but Tim Schafer heads that team anyway!). Check out that second video – it might be German, but it should give you a basic understanding of what to expect. 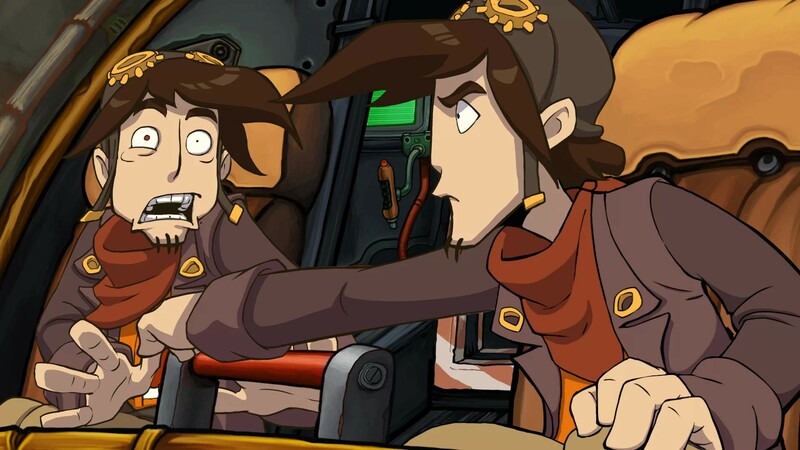 The Deponia-series do not want to be revolutionary. Instead, they provide a trip to the past, which might not be rated by many, but the few that do will like it. And that is why I give Goodbye Deponia an 8/10 – it’s a decent title, and while the graphics might look childish at first glance, I believe you can get used to it in no time. – Why didn’t it get more marketing…? – …and when will the fourth game’s port come?